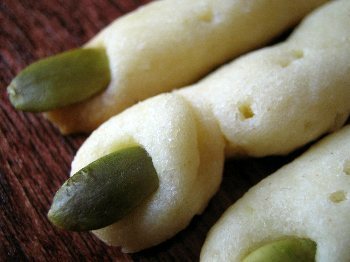 These creepy cookies look like spindly fingers but thankfully taste like shortbread. Use raw pumpkin seeds for gross green fingernails. Mix butter, sugar, egg, and vanilla until completely combined. Combine dry ingredients in a seperate bowl (except pumpkin seeds) and combine with butter mixture. Refrigerate dough for at least a half hour. * When you are ready to make the cookies, preheat oven to Grease a cookie sheet. Form dough into thin rolls. They don't have to be even - crooked fingers are creepy. Mine are about 1/3 inch wide and 3 inches long, but you could make them thicker and/or longer. Don't flatten them too much, though. Press a pumpkin seed into one end of the cookie. I like to press mine horizontally towards the other end a bit so it sticks well and sinks into the nail bed like a real nail. If you wish, you can either press a fork across the finger to create knuckles, or press the tines of the fork into the finger to create little holes. If yours are as thin as mine (1/3 inch), bake for about 10 minutes or until just slightly browned. If yours are a lot thicker, bake up to 20 minutes. * If you want to make these in advance, leave in the fridge, covered, for up to a few of days. The dough will dry out a bit but is fine after a bit of handling..